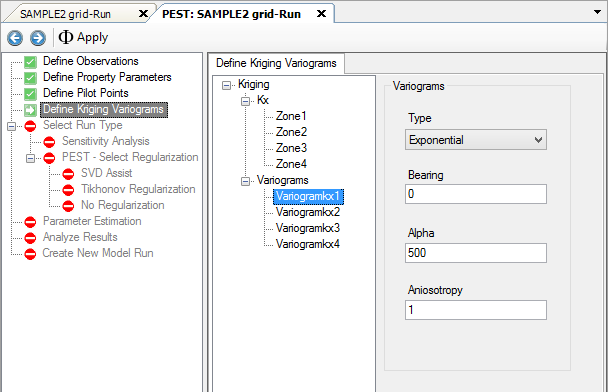 Once the pilot points are generated, the next step is to specify the Kriging settings that will be used to interpolate the pilot point data during PEST calibrations for these zones. Principally, this involves definition of the appropriate variogram. Variograms are also used by PEST in the calculation of regularization weights and so are an important part of the process. Visual MODFLOW Flex will create one default variogram for each parameter zone "structure". The only downside is that it requires a defined variogram to be effective and each parameter+zone must have its own variogram. 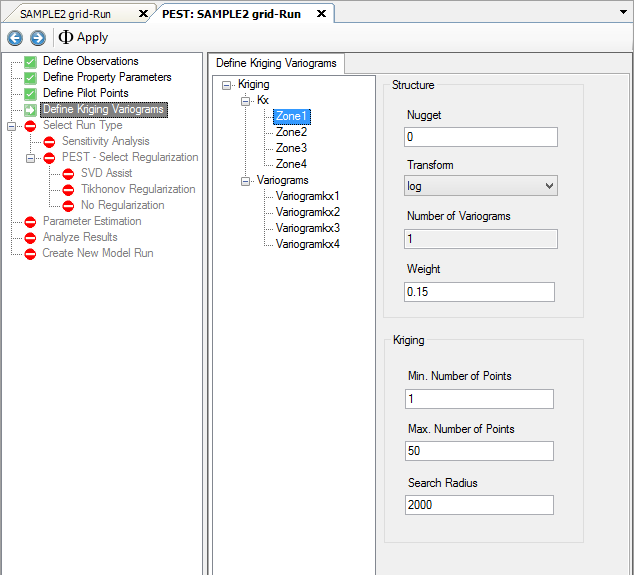 Select the desired Parameter zone from the tree, and provide the necessary variogram parameters. Please Note: Gaussian variograms are not recommended for use with PEST because they can lead to spurious interpolated property fields greater than or less than the highest/lowest property value assigned to any pilot point (Doherty, 2008a). The use of pilot points in characterizing the spatial distribution of a hydraulic property must be accompanied by a mechanism whereby hydraulic property values assigned to pilot points are spatially interpolated to the cells of the finite difference grid. Spatial interpolation is accomplished using the Kriging algorithm. Kriging is a method of spatial interpolation based on geostatistics. The cornerstone of geostatistics is the variogram; a variogram describes the extent to which hydraulic property values (or any other type of data) pertaining to any two points are likely to be different from each other as a function of the distance between those points. One of the benefits of using Kriging as a basis for spatial interpolation is that the factors by which hydraulic properties at pilot points are multiplied before summation to obtain the hydraulic property value at a particular grid cell are independent of the actual hydraulic property values at the pilot points. Hence a set of “Kriging factors” pertaining to each of the cells of the finite difference grid can be calculated in advance of the actual interpolation process. As the latter is undertaken again and again as the model is run repeatedly by PEST, the fact that it is not necessary to repeat calculation of the Kriging factors on each occasion that the model is run can result in large savings in the time required to complete the overall parameter estimation process. Calculation of Kriging factors is undertaken by program PPK2FAC. Variograms upon which these Kriging factors are based are supplied to PPK2FAC in a “structure file”. Such a file is struct.dat. Inspect this file using your screen editor. For full details of the specifications of this file, see the documentation to the Groundwater Data Utilities. Note that the variogram assigned to zones that have just a single pilot point is quite unimportant; because there is only one pilot point assigned to each of them, all cells within these zones will be assigned the one interpolated value (same as the respective pilot point) irrespective of the variogram. Also note that for all of the structures appearing in file struct.dat, the TRANSFORM variable is set to “log”. Thus any variogram cited in each of these structures must pertain to the spatial distribution of the logarithm of the pertinent hydraulic property. This is in accord with the fact that most studies cited in the groundwater literature which treat transmissivity and/or hydraulic conductivity as a regionalized variable indicate that its distribution is better described by a log variogram than by a variogram based on native property values.